MyGica A681 ATSC QAM OTA Live Local Antenna HDTV USB Digital Tuner Windows PC. Condition is New. Shipped with USPS First Class Package. ATV520e TV Box. Model: ATV520e. Built in 802.11b/g/n WIFI module, wireless Internet access. HDMI cable. HDMI video output, connect to HDTV for HD video playback. Audio Line. YPbPr color component video cable. Video coding: H.264, MKV, WMV9, MPEG1/2/4, HD DIVX, XVID, FLV, RM / RMVB. HD audio interface HDMI interface, coaxial digital audio and stereo. Video Interface HDMI, YPbPr, CVBS output, etc. MyGica Capit USB Video Capture for Windows, Capture Analog Video to Digital, Convert VHS Composite and S-Video to USB on PC - Black. 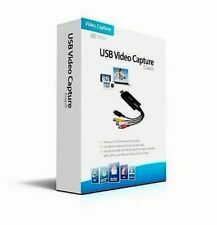 Capture video from VHS, V8 or other analog video source to digital on your PC; Transfer from S-Video/Composite cable to USB 2.0 port on Windows PC. Alternate Audio Video Interface : Mini RCA Composite Video & Stereo Audio. Video Playback Codec : MPEG 1/2/4,H.265,H.264,VC-1,WMV,AVI,MKV,MOV. Video Interface : 1 x HDMI 2.0 (HDCP 2.2). Micro SD Card : 1 Slot Max 128GB. This is a used Mygica 1900 Pro Android TV player 4K Quadcore 64 bit with android 5.1. Item was tested and works very well. Also includes the power cord, air mouse with built in keyboard and the manual. MYGICA ATV 495X HDR. The MyGica 495X HDR is the next generation of the ATV 495 product line. MyGica ATV 495X HDR. Graphics Processor : Penta-core ARM® Mali™-450 (HDR). Upgrade able to Android 7.1. Video Interface : 1 x HDMI 2.0 (HDCP 2.2). The best warranty in the world. Your box is already covered no matter what happens to it. Power up your TV with 64 bit smart streaming box. This is LIKE NEW OPEN BOX. You can expect a fully functional product. Don't be fooled by the diminutive size of the ATV 329X. With serious upgrades in our small form factor Android Box, MyGica succeeds in achieving the next level of excellence. Video Playback Codec : MPEG 1/2/4,H.265,H.264,VC-1, WMV, AVI,MKV, MOV. MyGica ATV1802 Quad Core Android TV Box features Quad core processor, 2.0GHz and Android 4.4 OS. ATV1802 is able to H.265 hardware decodong and UHD (4K2k) video and supports 2.4Ghz/5.0Ghz WIFI 2T2R with 2 external WIFI Antenna.With the Android TV Box Quad Core ATV1802, you can surf the internet via WiFi, communicate with your friends via SNS applications, and enjoy online movies, music and photos with your families and friends.. Condition is New. Shipped with USPS Priority Mail. 30 Days Returns for your Money Back! We promise a Great Purchase and Customer Service! Fast Processing, We Usually Package the Same day of Payment. Our customers are important to us, if you have any questions about our product please send us a message and we will be happy to assist you in the best way possible! . ATV1960 Octa Core Android TV 4K Box 3GB RAM / 16GB Memory Internal 2.5″SATA HDD. Condition is New. Shipped with USPS Priority Mail. MyGica HD Cap X-II Video Capture. H Cap X-II video capture device can record 1080P Full HD video, stereo audio and with microphone input to record speeches to the recording video. Mygica Capit-Video Capture Device for Windows. Capture video source from VHS, V8, and Hi8. USB device, easy to install. 1 X User Manual. Submit video files to YouTube.